I am a class list freak! I swear I keep checklists for everything. I have one for AR, Math In Focus Assessment Data, Spelling Test Scores, Writing Scores, Homework Scores, etc, etc, etc. And not only do I have checklists....but you know they have to be cute. I used to get mine from The Mailbox (when our school had a subscription) but we no longer have that so where to get them???? Well, I just made my own! I have uploaded them to my TPT store and you can get yours for free here in my TPT store! And did I mention they were editable?? I know. You can thank me later. 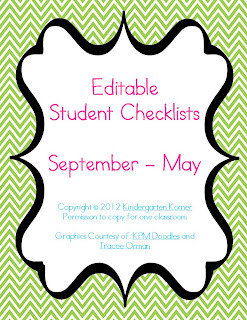 If you download, I would love for you to follow my blog and my TPT store! I also love feedback! Thanks so much! Have a great week! Thanks so much! I'm still trying to figure out how to do this editable thing?? LOL and keep the graphics and what not secure...any suggestions! ?